Prior to having this, I'd had two kinds of cherry beers: the incredibly sour kriek, and the cough-syrup sweet nastiness. I expected this one to fall into the sour category, but I was quite wrong. Not to say, obviously, that that was a bad thing. 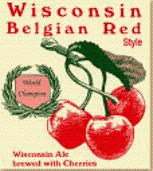 This beer is brewed with handfuls of Wisconsin cherries, and the flavor is not that of a cherry-flavored beer, but a mouth-coating cherry spritzer that happened to have fermented. It tasted like cherry pie in a glass. By far the best fruit beer I've had, and one that I'd present to guests. Now, if only we could get New Glarus in Minnesota. I think it is a very convenience and save time way to buy goods.Buy christian louboutin shoes sale andAir JordansNike Jordan Basketball Shoes,we offer cheap nike shoes cheap nike shoes at low price.nike jordan retro shoesAir JordansNike Kicks,we also see cheap Air Force OnesNike Dunks LowAir Jordans ShoesNike shoesed hardy shirtsMBT Shoes SaleChristian Louboutin Shoeschristian louboutin shoes saleQuality of Nike shoesWholesale Nike Shoes.They have put so much effort to provide a great customer experience that it gives them a great differentiation and customer satisfaction tool, which ultimately drives customer satisfaction and business success.